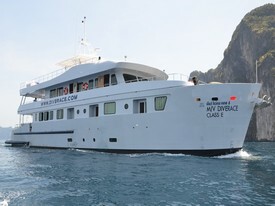 The MV DiveRACE E-Class is the newest and probably most comfortable Liveaboard boat in Phuket. She offers cruises to the Similan and Surin National Parks as well as some Burma cruises. The unique design with private balconies and generous cabin space will make a trip with her an unforgettable experience. Beautifully designed and constructed to plan, this vessel is made for divers in mind. Come on board to try her out. With her 2x1200HP engines, she can sail to destinations in a shorter period of time. Also, all major systems are in pairs to ensure that we have spare in the event of any breakdowns. MV DiveRACE Class E provides a host of facilities and services. Luxuriate in the warm rays of the sun and enjoy a chilled drink on the spacious sun deck. Between dives, you may choose to watch the latest movies on a 60" 3D TV in the comfort of the air conditioned saloon, or indulge in a relaxing massage in the private massage room. Photographers are welcome to utilize the multimedia stations to edit their works. Exquisite meals are planned and executed for guests every day, and a hot towel and tea after each dive awaits each diver to soothe and refresh themselves. Fresh towels are brought to your room daily and laundry services are available on request. MV DiveRACE Class E comprises two cabin types – the Double Bed / Twin-Bed luxury cabin and the Twin cabin equipped with a private Toilet and sink but with a shared shower. The 6 the Double Bed / Twin-Bed luxury cabin comes with its own private balcony. Furthermore, guests may also choose to have their beds arranged in either a single or double bed configuration. All cabins have personal bathrooms with toiletries provided. Each cabin comes with its own individual air-con control and charging sockets.